When the Globe Town Mural is plastered over later this month it will mark the end of an era for those who grew up playing beneath this local icon. Painted in 1992, the mural stands on Sewardstone Road, between the Wellington Estate and the Grand Union Housing Co-operative. 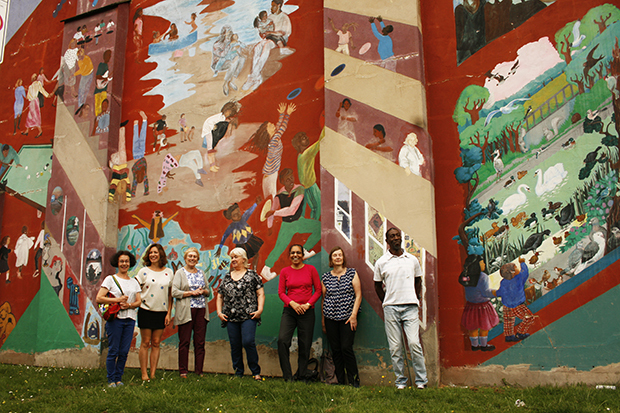 Residents from the estate and the cooperative worked together to design and paint the six-panel artwork with the help of renowned mural artist David Bratby. About 20 people were engaged in the project, depicting themselves and their families. Also included are imaginary vistas that hold particular significance for local people: a Dominican beach scene, a sylvan clutch of birds, and the pagoda that once graced nearby Victoria Park but which, by 1992, was but a distant memory. The pagoda was rebuilt for the 2012 Olympics, bringing the park up to date with its image on Sewardstone Road. Bratby teamed up with local co-op resident and artist Laurence Macdermott to oversee the design of the painting, and the pair ended up working together on similar projects around London. The wall took approximately three months to complete. Children took charge of the lowest part of the image while adults worked on the upper areas, painting in bits that had been outlined in chalk by Macdermott and Bratby. When asked by the East End Citizen what struck him about those involved in the project, Bratby said: “They were quite diverse, different communities all came together”. At the time the mural was painted, an adjacent community centre was a vibrant hub. Barbara Moss and Brenda Thomas ran a laundrette in the premises, around which residents congregated and socialised. Gabriela Salva, who grew up on Wellington Estate and knows most of the people in the mural, has been active in chronicling that pivotal period in the 1980s and 1990s. She said: “I don’t think anyone realised at the time what the mural signified”. Several years after the project was completed, the laundrette closed and the neighbourhood changed forever. Yet local residents are proud of the fact that the mural is one of the few walls in the area that has never been vandalised. Ruth Miller of the London Mural Preservation Society said: “One of the reasons we value the Globe Town Mural is that it pictures local residents and they still have an interest in the artwork. Not often do local communities get the opportunity to be portrayed in their local area. But preservation does not appear to be an option for the Globe Town Mural. The wall it adorns is owned by the co-operative, which maintains that works need to be carried out to maintain the building’s structural integrity, and that this will necessitate plastering over the painting. Ruth Allan, spokesperson for the grand Union Housing Co-operative, said: “We need to do major work to our end of terrace property which is unavoidable. “The ends of terraces take the strain of the entire terrace and the work required is because the render is crumbling and cracked in parts and this is causing internal damp and condensation. “We also have a legal obligation to uphold the decent homes standards as set by the Homes and Communities Agency. “It is true that the mural will no longer be visible and will be underneath the work due to be undertaken. Allan hopes that it will eventually be possible to fundraise for a replacement mural, with the help of the Tenants’ and Residents’ Association that Gabriela Salva is currently setting up. So if one era has come to an end, another spell of community partnership may yet be about to dawn.